This past weekend was long and beautiful, full of fun workshops, yogi community and lots of practice breakthroughs–everything the Atlanta Yoga Conference should be. 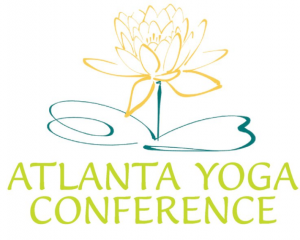 I did all three workshops each day (totaling 12 hours of yoga! whoa!) and wanted to summarize some of my time. I know that everyone had their own unique encounter, blending their variety of workshops and teachers, so my time spent represents only one shred of a potential of hundreds of possible experiences. Ain’t it beautiful? Started out in Yoga for Pilates with Kristin McGee. Kristin demonstrated with encouragement and flair how to get the most out of a yoga class by finding your core and pelvic floor. Gave me LOTS of stuff to think about for getting the most physical impact out of a yoga class and prepped me well for my arm balancing class later! I discovered that my core is pleasantly stronger than I thought it was! Moved on to Arm Balancing & Inversions with Brianna Norton. Brianna is one of the city’s great teachers because she’s not afraid to challenge people to reach a potential far beyond what they think they can. Simultaneously frustrating and empowering, her workshop pushed me into sweaty bliss with a spirit of exploratory fun. And a few tumbles. And a breakthrough in my center-of-the-room handstand! I REALLY wanted to take Faith Hunter’s arm balancing class afterward, but I was exhausted from the first one, so I respected my body and went to Sara Mingus’s Hip Opener workshop. Sara is one of the sweetest, most geniune, light-radiating people I had ever taken a class from. We stared with a yin opening, holding hip-opening postures for a long time which was a pleasant repose from the last workshop. I was too tired to give it my all in the vinyasa part of the class, but it was such creative, fun sequencing that I kept up anyway. This would have EASILY been my favorite workshop had I not been so tired! Commenced at Inner Spiral: Radical Expansion workshop with Gina Minyard. It was radical. Gina’s explained Anusara’s Inner Spiral so eloquently and practically that I really started to “get it,” as did everyone else it seemed, as the room filled with “ooooh!” every time she showed us applications of the alignment principle. And then she’d talk about how it relates to spiritual growth, which brought yoga into a new light for me. The body as a means for spiritual expansion. I then Loved my Lower Back with Rutu, who gave the first more workshop-like class I attended, reviewing in-depth anatomical reasons for lower back pain, muscles involved, how to find them, and all the yogic exercises to free those areas. Since I tend to be overly bendy in my back,to the point of pain, I got a lot out of it. Lastly, and most blissfully, I Relaxed Renewed and Restored with Marti Yura. I’ve talked before about how restorative yoga changed my life, and I was very excited to have this as my last class of the weekend. It was blissful, as we relaxed and learned about sensory awareness training for yoga. Just imagine what it might feel like to successfully run a marathon and then having Justin Timberlake sing softly to you while giving you the most amazing massage. That good. It was also just good to meet everyone in person! I had the best time hanging out with familiar faces, meeting new ones, and feeling like a community together. What was your experience? Would you recommend people go next year?